Objectives: Pain modulation through the combined effect of vibratory stimulation of Aβ mechanoreceptors and cold thermal stimuli has been demonstrated to reduce the pain associated with injections and IV cannulation. Although past reports have focused on its use on the upper extremity, there are no current studies to evaluate the efficacy of these combined modalities for lower extremity injections. The authors propose the combined use of vibratory stimulation with cold thermal stimulation will yield lower reported pain values associated with injection compared to cold thermal stimulation alone. Methods: In this multicenter, randomized, prospective clinical trial, 108 patients necessitated a lower extremity injection for the treatment of their presenting condition and was randomized into a treatment (vibration and cold spray) or control (cold spray only) groups. The primary outcome was pain, subjectively measured on a 10-point numerical pain rating scale (NPRS) by the patient. Pain was also ranked by an observing physician via the Wong-Baker Pain Faces Ranking Scale (WBPFRS). Results: Forty treatment subjects and 68 control subjects were included in this study. 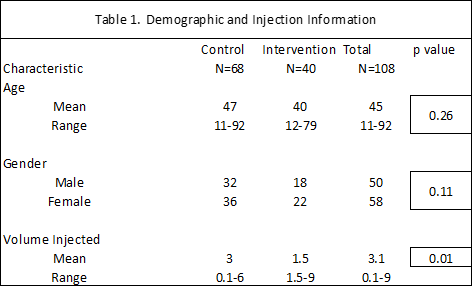 Pain scores were significantly lower in the treatment group receiving the vibratory device and the cold spray compared to the cold spray alone (NPRS mean values: Treatment: 3.39, Control: 4.46; p=0.022. WBPFRS mean values: Treatment: 2.29, Control: 4.05; p=0.030). Discussion: Utilizing a combination of cold spray with vibratory stimulation produced a statistically significant decrease in pain associated with lower extremity injections. Due to the relatively small size of our study, further investigation is needed to assess effect on specific injection site. Injection therapy has been a mainstay intervention for addressing musculoskeletal pain for over 50 years . Foot and ankle physicians commonly perform office procedures which are made tolerable by first injecting local anesthetics. Unfortunately, injections to the foot and ankle often elicit exquisite pain due to a greater density of sensory nerve endings in that area of the body  and the depth of some of the injections. The pain and anxiety from needle injections can have deeper consequences such as impaired patient compliance, deferral due to needle phobia  or lack of follow-up due to fear of future injections . There can be value in utilizing interventions to reduce the pain associated with injections. Therapeutic outcomes could possibly improve by increasing patient compliance and reducing fear avoidance if injections are perceived as less painful. Increased patient satisfaction and the overall patient experience could be maximized. Although there are distinct benefits from decreasing the pain associated with needle injections, there remains a dogma that injection pain reduction modalities are deficient . There are options available that deserve consideration utilizing various mechanisms. Pharmacological intervention via topical or injectable anesthetics, are commonly used. While this intervention has been shown to alleviate pain associated with injections [3,7,8], it is not without drawbacks. The use of topical anesthetics can cost $20 or more . Additionally, these can prolong time in the office and procedure times, since it takes time for the induction of effective analgesia . The drug cost can present concerns regarding the stewardship of already strained healthcare resources. In addition to pharmacological interventions, there exist other modalities which utilize the gate theory of pain control. Cold therapy  and activation of Aβ sensory fibers through vibratory stimulation  of mechanoreceptors are believed to cause presynaptic inhibition of the dorsal horn. This therefore “closes the gate” and reduces the transmission of nociceptor signals. Cold therapy has demonstrated efficacy in reducing injection pain in both adult  and pediatric [7, 13] groups. Cold therapy sprays are commonly used in an office setting for immediate but temporary analgesia for the time of injection. In addition, vibratory stimulation to manage pain from injections has yielded positive results in adult [9,14] and pediatric [15-17] populations. Reusable devices that produce a combination of cold and vibratory stimulation to manage injection pain have been developed; one such device is called “Buzzy®” (MMJ Labs Atlanta, GA). There have been a number of studies which have demonstrated its efficacy in reducing injection pain, but these studies have focused particularly on pediatric IV access [9,16,18,19]. This device has the advantage of being reusable, easy to use and does not require much additional time. The clinician uses a built-in Velcro strap to apply the device proximal to the injection site. While there is evidence this device can reduce injection pain related to venipuncture access, no studies have investigated the efficacy of this device for pain management of injections to the foot and ankle. It was the goal of this study to determine whether pain associated with injections to the foot and ankle is decreased when using the Buzzy® (or vibratory) device. Our study was a multicenter, prospective clinical trial using 108 patients needing an injection to the foot or ankle. The study was explained to every patient and consent to participate was obtained. This study was performed at the Temple University School of Podiatric Medicine’s Foot and Ankle Institute (FAI) clinic (n=42) and in a separate private practice podiatry clinic (n=66). Participants were excluded if they had: skin compromise over the vibratory device application site, history of peripheral neuropathy, fibromyalgia, complex regional pain syndrome, cognitive or verbal impairment, patients who were blind or not fluent in English, and those impaired via narcotics/analgesics within 4 hours prior to the office visit. The primary outcome variable was pain, which was measured utilizing an 11-point Numerical Pain Rating Scale (NPRS). The patient reported their pain on a scale of 0-10 where 0 is no pain and 10 is the worst pain imaginable. As a secondary variable outcome, pain was assessed via the Wong-Baker Pain Faces Rating Scale (WBPFRS). It should be noted WBPFRS was only collected on the FAI patients by an observing physician. The patients were not made aware of the WBPFRS measurement to minimize chances of altering their facial expressions in front of the physicians. After informed consent was obtained, patients were randomly assigned into the treatment or control group. The treatment population was treated with external vibratory stimulation delivered through the vibratory device and cold spray prior to injection. The control population was treated solely with cold spray prior to injection. Determination of randomization was performed immediately before injection. At the FAI, randomization was performed via drawing an opaque envelope whereby the instructions inside would assign the group. At the private practice clinic, randomization was achieved by randomly assigning subject numbers with control or treatment groups. As patients presented for an injection, the patients were assigned the next consecutive subject number. Demographic information consisting of age, gender, and whether they have had an injection to the foot or ankle previously was recorded on the questionnaire. The attending physician instructed the patient on using the NPRS. In order to maintain consistency of the pain data, the patient was instructed to rank the pain associated with the initial needle stick, but to not watch the injection being performed. The injection site was first prepped with alcohol or betadine. If the patient was assigned to the treatment group, then the vibratory device unit was applied 5-10cm proximal to the injection site over the anatomical location of the appropriate sensory nerve(s). The vibratory device was turned on for approximately 1 minute prior to and maintained during the injection. 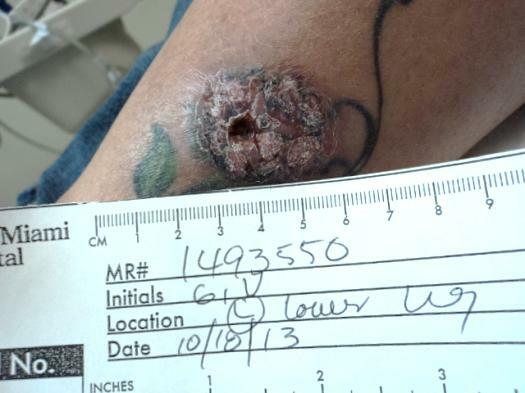 In both groups, Gebauer’s Ethyl Chloride® (Cleveland, OH) was applied to the injection site, and then a 25 gauge needle was inserted. The injection was performed under the supervision of an attending physician (TV or RH). At the private practice clinic, all injections were performed by 1 attending physician (CK). During the injection, the attending physician at the FAI assessed pain utilizing the WBPFRS. In the private practice setting, the attending was visually focused on the injection and not the face; therefore WBPFRS was not recorded. After the injection, the patient was asked to rank their pain on the NPRS, and if the injection was better or worse than anticipated. It should be noted, the vibratory device does come with reusable ice-packs to provide the cryothermal stimulation; however, cold spray was utilized in its place in order to minimize deviation from the clinic’s standard of care. The outcome variable was pain. This was ranked primarily via the NPRS between the treatment and control groups. Pain ranked by WBPFRS was utilized as a secondary outcome variable. The unpaired t-test was used to evaluate the statistical significance of the NPRS and WBPFRS values between the treatment and intervention groups. The criteria for significance between the values was a p value <0.05. Statistical calculation was performed utilizing GraphPad® statistical software. One hundred and eight consenting patients were recruited to participate in this study. Based on our parameters, no patients required exclusion from the study. The treatment group (n=40) was composed of 18 (45.0%) males and 22 (55.0%) females with a mean age of 39.2 ± 20.9 years (range 12-79 years). The control group (n=68) was composed of 32 (47.0%) males and 36 (53.0%) females with a mean age of 43.5 ± 23.2 years (11-92 years). There was no statistically significant difference in age or gender between the groups (Table 1). The material injected was as follows: for the intervention group 14 received a steroid cocktail (acetate and phosphate-based steroid, diluted in local anesthetic) and 54 were injected with only local anesthetic (1% lidocaine or 0.5% marcaine plain). Table 1 Demographic and Injection Data. Table 2 Pain Measurements using both scales. Table 3 Pain Rating Mean Values. For the treatment group, the mean NPRS value was 3.39 ± 2.67 (0-10) and the mean WBPFRS was 2.29 ±1.59 (0-6). Seventeen patients reported the injection was “better” than expected while 6 reported it was “same” and 1 “worse” than expected. With regards to the control group, the mean NPRS value was 4.64 ± 2.72 (0-10) and the mean WBPRFS was 4.05 ± 3.13 (0-10) (Table 2). Twenty six reported the injection was “better” than expected while 8 reported it was “same or worse” than expected. In terms of anatomical location of the injection, an injection into an intermetatarsal space the addition of vibratory stimulation to cold spray provided the largest percent difference in NPRS scores, whereas hallux block showed the least reduction in pain (Table 3). It is recognized that control of pain contributes to improved clinical outcomes and patient satisfaction. This right unfortunately comes with added costs monetarily (i.e. cost of of topical lidocaine) and in time (delay for topical anesthesia induction)[20, 21]. These can provide added cost and personnel burdens to an already resource-strained healthcare system. These barriers, combined with attitudes that injections will cause pain, hamper the use of interventions to reduce injection pain. It has been reported that only 6% of pediatricians utilize available interventions to reduce the pain associated with injection therapy . In our study, we investigated the use of eliciting the pain gating theory to activate descending noxious stimuli inhibition to manage pain associated with injections to the foot and ankle. The pain gating phenomenon was first described in 1965 where Aδ pain fibers shared a final common pathway with thermal and Aβ, and stimulation of thermal and Aβ would effectively “close the gate” to noxious stimuli from Aδ nociceptors . By combining the use of vibratory stimulation and cold spray it may be possible to maximize pain reduction. The hope of our study is to demonstrate if this is possible in our clinics (Table 3). Through the combined use of the vibratory device with cold spray, we demonstrated an appreciable decrease in pain associated with injections to the foot and ankle. Our primary outcome was pain reported by the patient utilizing the NPRS. We report a mean drop in NPRS scores from 4.64 to 3.39; this represents a 31.3% decrease in pain associated with injections between the treatment and control group. Our secondary outcome was an observer physician-recorded pain utilizing the WBPFRS; mean scores dropped from 4.0 to 2.29 representing a 54.4% decrease in mean pain recorded through this scale. Both of these outcomes were statistically significant with p values of 0.022 and 0.03 respectively. While a statistically significant decrease in pain through this or any intervention might seem like a definitive success, it is still imperative to consider whether this significance translates into a clinically relevant context versus a purely numerical context. There exists a number of studies that address this matter. Todd et al  determined a decrease of 13mm on the 100mm VAS yielded a clinically relevant decrease in pain. There are other arguments that relative decrease in pain is more clinically relevant than the decrease in the absolute value of the pain. Campbell et al  within the setting of a dental surgery practice, determined a decrease in VAS score by “between 31% and 48%, depending on its initial intensity” is requisite to be considered clinically relevant. In a study by Farrar et al  10 clinical control trials for chronic pain interventions were reviewed, and it was concluded a 30% decrease in pain scores indicated a significant decrease; furthermore, this 30% decrease was determined to correspond to a 2-point decrease on the NPRS. Comparing our data to that of the studies mentioned here, utilizing the vibratory stimulation in addition to cold spray did produce a clinically significant reduction in pain. Comparing patients’ expectations (better or worse than expected) between treatment and control groups was performed by Fisher’s Exact Test which yielded a p value of 0.76, thus no statistical significant outcome can be drawn from this. In terms of patient’s tolerance of the vibratory stimulation, it was tolerated well as only one commented that, “It felt annoying.” With regards to ease of use, no one in either clinic reported any difficulty in using the vibratory device. This study is not without limitations. The first of which is pain scores were only from one patient encounter. Pain is well noted to be an extremely subjective sensation in terms of perception and tolerance with wide variation between people. Additionally, it is well known that pain has multidimensional contributing factors, such as anxiety or recent pain sensations . As such, measuring the pain of a heel injection between various people can elicit widely different values, even if no intervention is used. Another limitation of this study was for the injections performed at the FAI. There may be differences in injection technique, ability, and apparent confidence between attending physicians. 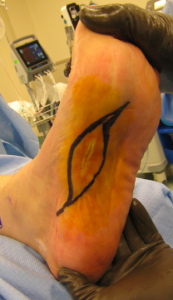 Finally, this study included injections to any anatomical location to the foot and ankle. It is likely an injection to certain parts of the foot or ankle will naturally just elicit more pain than other areas would. This is expected due to the possible sources of sensory nerve distribution and the vibratory device’s ability to effectively target more than one sensory nerve simultaneously. In the future, the device may be better contoured for the ankle so as to prevent slippage and simultaneously affect numerous nerves. Injection techniques were not standardized as well. 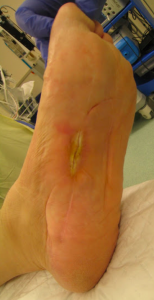 For instance, one of the clinicians prefers a medial glabrous skin junction approach for painful heel injections while the other prefers a plantar approach. Also, there may be inherent differences based on the composition of local anesthetic and injectable corticosteroid, which varied greatly in makeup proportion and delivered amount. Temperature of injectable, pH of injectable, needle gauge and quantity injected are possible covariables which were not studied. The investigators did find that it was harder to apply the vibratory device to some parts of the foot versus others due to anatomical contouring of the unit. This may have affected the ability of the device to work optimally and target the desired areas. As seen in Table 3, there is marked variation between pain scores and location of the injection. Lastly, although it was attempted to not influence a known effect of the vibratory unit, it is possible that natural bias was placed on the patient to downplay perceived pain. This could have been avoided with a double-blind study protocol. The authors believe further studies are needed to better understand and quantify potential benefit of such devices. Future modifications of such units may optimize use and benefit also. This pilot study suggests that the combination of vibratory stimulation and cold sensation does reduce the pain associated with injections to the foot and ankle. Further control of cofactors is necessary to conclude how effective and specifically which injections (injectable and location) and patient demographics are most affected. The combination of external vibratory stimulation in addition to cold spray produced an appreciable reduction in the pain in comparison to cold spray alone for our patients undergoing foot and ankle injections. Further investigation is warranted for injections of the lower extremity. 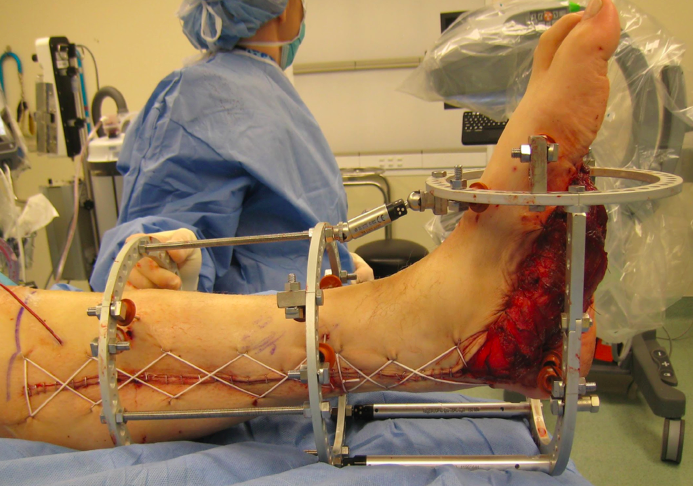 Compartment syndrome of the lower leg is typically viewed as a surgical emergency. Elevated pressure within a closed myofascial space impairs perfusion pressure below a level necessary for muscle viability. It is caused by bleeding or edema in a closed, non-elastic muscle compartment surrounded by fascia and bone. 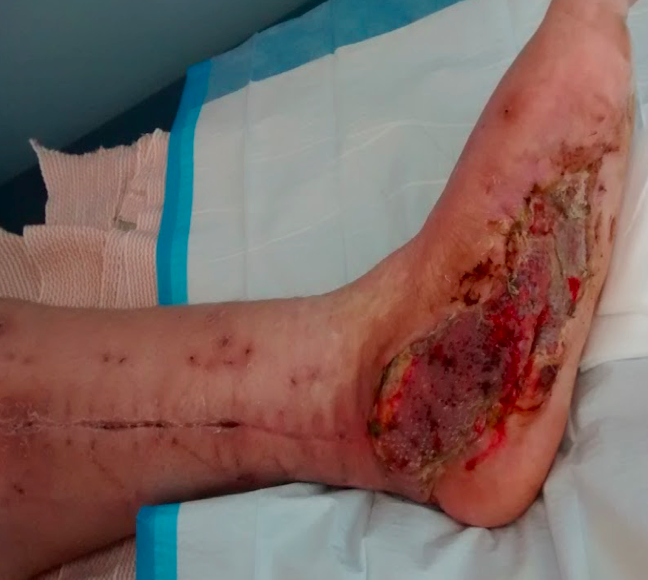 We report the case of a 66-year-old patient on warfarin with acute compartment syndrome caused by hemorrhaging from a ruptured Baker’s cyst. 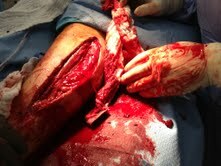 The patient responded well to an emergent fasciotomy. The present case highlights the need for an awareness of acute compartment syndrome in patients on warfarin therapy and clinical symptoms consistent with compartment syndrome. 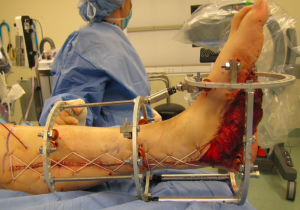 Compartment syndrome of the lower leg is a surgical emergency in which elevated pressure within a closed myofascial space reduces circulation below a level necessary for muscle viability. It is caused by bleeding or edema in a closed, non-elastic muscle compartment surrounded by fascia and bone . The long-term consequences were described by Volkmann in the 19th century following the application of casts . Acute compartment syndrome is typically associated with fractures, closed soft tissue injuries, revascularization procedures, and crush injuries . Anticoagulation has been suggested as risk factor in the development of acute compartment syndromes [4-6]. Extravasation of a ruptured Baker’s cyst and its damage on surrounding tissue has been linked to development of compartment syndrome [7,8]. 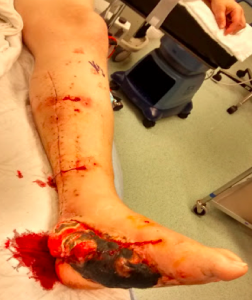 However, we did not discover any cases where a Baker’s cyst with concomitant anticoagulation leading to compartment syndrome have been discussed. 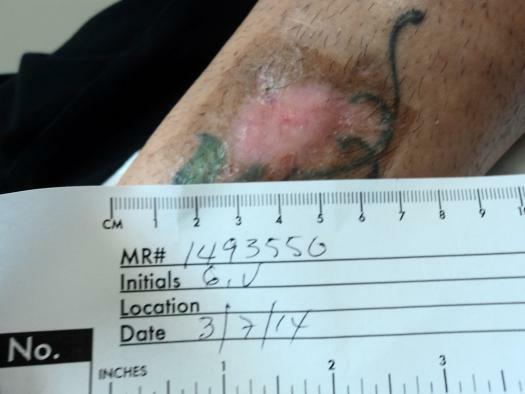 A 66 year-old female presented to the Emergency department with two days of left lower extremity edema and pain that began suddenly and had continued to progress. Past medical history included: psoriatic arthritis, Baker’s cyst left lower extremity, left venous stripping, hypertension, GERD, and pulmonary embolism. The patient had a hardware removal from the right foot two weeks prior, but denied any other trauma or injury. Examination revealed non-erythematous left calf measuring 40 cm in diameter (right calf measuring 33cm) with pain rated severe. Overlying skin was tense and unyielding compared to the contralateral limb. Sensation and pulses were normal. The patient had pain out of proportion with passive dorsiflexion and plantar flexion of the left ankle. Radiographs of the left lower extremity were negative for fracture revealing only arthritic changes. Figure 1 MRI T2 Sagittal. The mass is centered in the proximal half of the left calf an extends 20.1 cm in length x7.7 cm transverse x4.4 cm AP and compresses the medial head of the gastrocnemius muscle with myositis evident in the proximal fibers of the muscle. Edematous changes are present over the posterior fascial plane at the interface of the fascial plane and subcutaneous fat. Venous and arterial ultrasounds were performed and returned negative for deep venous thrombosis. Further ultrasound exam findings revealed an area of approximately 10 cm at the posterior left knee which was read as possible hematoma versus Baker cyst (Figures 1 and 2). With high clinical suspicion of compartment syndrome a wick catheter was used to measure intracompartmental pressures. The patient’s blood pressure was 139/70 mmHg Initial compartment pressures were read at: Anterior-12mmHg, Lateral-10mmHg, Deep Posterior-45 mmHg, Superficial Posterior-12mmHg. The deep posterior and superficial posterior compartment pressures were repeated and with consistent readings at 30mmHg and 12mmHg respectively. Figure 2 MRI T2 Axial. The heterogeneity signal and characteristics of the mass as well fluid level are suspicious for an active hematoma adjacent to semimembranosus/popliteal cysts within the gastrocnemius bursa. 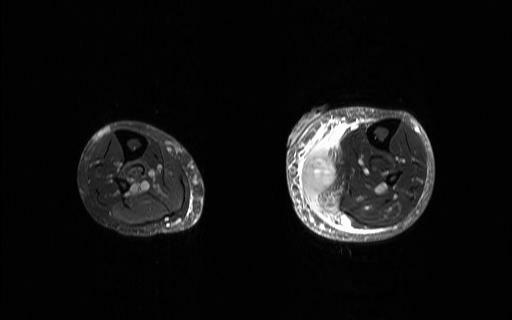 Given the unique presentation, a STAT MRI of the left lower extremity was completed. 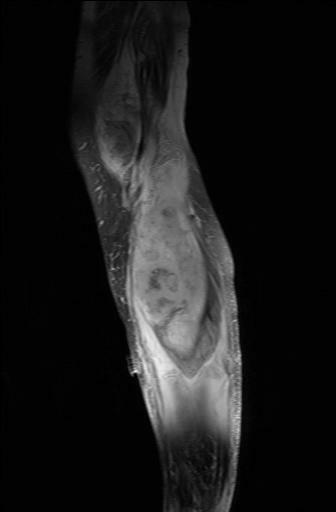 MRI findings revealed a complex large mass to the posteromedial proximal half of the calf with accompanying gastrocnemius muscle edema, suggestive of a complex hematoma with active bleeding (Figure 2). The characteristic enhancement suggested the possibility of a chronic popliteal cyst with intracystic hemorrhage. The mass appeared to be superficial to the muscle and compressed the muscle component. Also of note, the patient was on warfarin for a pulmonary embolism that had occurred 6 months previously. Patient’s laboratory values were: Prothrombin time 26.3, INR 2.4, partial thromboplastin time 41. The patient was taken to the operating room for emergent open fasciotomy of the compartments of the left lower extremity. Figure 3 Intraoperative hemorrhaging and herniation of muscle belly upon release of the fascial compartments. 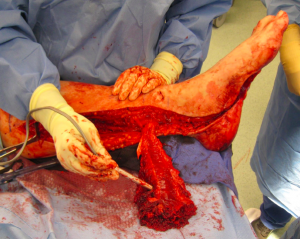 Through a standard anterolateral extensile approach all four-muscle compartments of the lower extremity were decompressed and hematoma was evacuated (Figure 3). The incision site was approximated using staples (Figure 4). Patient was placed in a modified Jones compression posterior splint. 1500 mL of blood loss occurred during the operation, requiring type and cross match blood transfusion of two units of packed red blood cells. Figure 4 Incision re-approximated utilizing staples. Post-operatively the patient was transferred to the ICU where pain was improved immediately post-operatively. After a 6-day hospital stay the patient was deemed medically stable and released for outpatient treatment. The patient was taken off of warfarin and an IVC filter was placed. 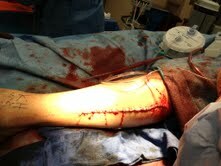 The patient had wound dehiscence of the distal aspect of the incision requiring local wound care of a 4-month duration. Few cases relating an acute onset of compartment syndrome to a Baker’s cyst or as a spontaneous occurrence with anticoagulation have been described [4-8]. Petros et al, reported the incidence of a ruptured Baker’s cyst misdiagnosed as a deep venous thrombosis, which was then treated with anticoagulation creating hemorrhaging and hematoma into the lower extremity compartment . The risk of developing a compartment syndrome after a ruptured Baker’s cyst especially when associated with coagulopathy should be considered. An acute compartment syndrome is a medical emergency. Irreversible changes are known to occur after 8-12 hours of increased compartment pressure. Immediate evaluation should include compartment pressure measurements, and if elevated, surgical decompression. A fasciotomy should be performed when the difference between compartment pressure and diastolic blood pressure is less than 30 mmHg or when clinical symptoms are obvious . In summary, we present a patient with a ruptured Baker’s cyst on long-term anticoagulation therapy with an INR in the therapeutic range complicated by the development of a posterior compartment syndrome. Acknowledgements: Craig Clifford, DPM; Research Chair, Franciscan Foot and Ankle Institute. 2. Volkmann R. Die ischämischen Muskellähmungen und Kontracturen. Zentralbl Chir. 1881;8:801–803.